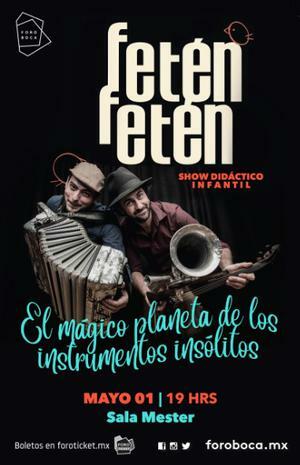 Feten Feten is much more than the musical project of Jorge Arribas and Diego Galaz, it’s the language of the soul in harmony. The first notes were heard in 2009 out of the necessity of these two musicians from Burgos to “soundtrack” their influences and memories. Feten Feten’s music is a path through the memory of our roots and traditions. Their compositions guide us, using dance rhythms, through the fox-trot, the waltz, the chotis (traditional dance music of Madrid), seguidillas (music and dance piece in a fast triple rhythm) or habaneras, making us sway with their chords on the Iberian Peninsula and making us fly from Italy to Japan or from Argentina to Portugal. The result is a fresh and original music suitable for dancing and having fun as you listen to beautiful waltzes, fox trots, chotis, jotas, seguidillas, rondas, pasodobles or habaneras. 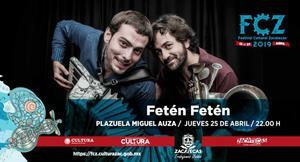 It’s a live performance of instrumental melodies that goes back to our roots and adds renewed musical nuances that recall the different European and South American landscapes that Fetén Fetén has visited while on tour. It’s a musical journey that conveys us from the Iberian Peninsula to exotic lands, assimilating Balkan echoes, manouches sounds, Japanese evocations, the cries of seagulls and even the sound of the waves. The original compositions of Fetén Fetén, a variety of musical trends, manage to make the audience smile with evocative sounds and titles like “The Wasabi Jota,” “I’ve seen a bear in the Carpathians,” “Fandango de Atapuerca,” or “Swing in a fricassée.” It’s a repertoire that amuses and thrills both children and adults alike, since this music tells stories without words and blends well with audiences either in big concert halls or in the open air. They have played in over 600 concerts across the Iberian peninsula and have participated in important festivals such as Pirineos Sur, Folk Segovia, Tres Culturas, Madrid Folk, Facyl, Clásicos en Alcalá, Noches y Almenas, Actual, etc. 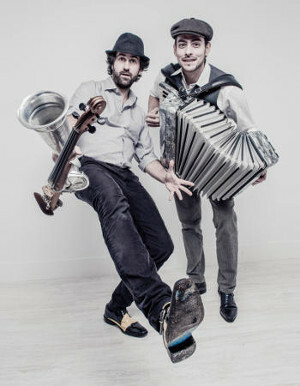 In 2010, they started the first of their international tours in places like Costa Rica (Arts Festival), Nicaragua, Belgium (Marni Jazz Festival Brussels) Argentina, Morocco (Instituto Cervantes), Latvia, Estonia (Viljandi Folk Music Festival), Slovenia (Keltina Festival), Slovakia, Germany, Tunisia, Austria (International Accordion festival), Portugal, UK and USA. 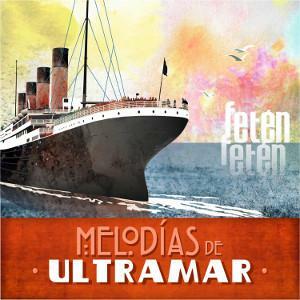 Fetén Fetén live offers a repertoire of sensations on its three instrumental albums “Fetén Fetén” (2011), “Bailables” (2014) and “Melodías de Ultramar” (2018), a repertoire which is in perfect union with the crowd. Their enthusiasm is instilled in every concert, from auditoriums to village squares, thrilling children and adults alike. Where their music speaks, words aren’t necessary, although they do exist in the Fetén universe. In 2016 they released the album “Cantables” (“Singables”) [Sony Music], twelve compositions which Sebastian Schon provided lyrics for and which Natalia Lafourcade, Fito Cabrales, Kevin Johansen, Rozalén, Melingo, Arnaldo Antunes, Julieta Venegas, Vicentico, Pedro Guerra, María Ezquiaga, Andrés Suarez and Jorge Drexler interpreted. Collaborations with renown artists such as Jorge Drexler, Pasión Vega, DePedro, Rozalén, Javier Ruibal, among others, as well as their participation as special guests on the 20thAnniversary Fito & Fitipaldis Tour complete the path of this versatile duo. 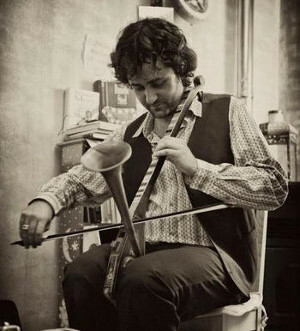 Diego Galaz: Violin, trumpet violin, phonoviolín, saw, mandolin, seagulls and… cows. 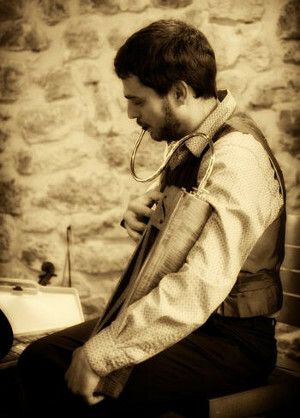 Jorge Arribas: Accordion, camping chair flute, vulture’s wing, flute, castanet and… cowbell. 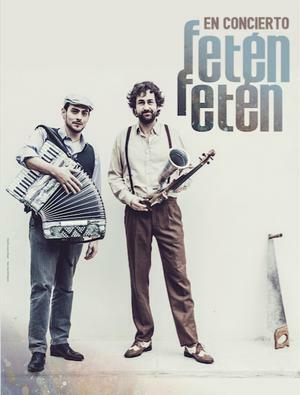 “The duo Feten Feten belongs daring stock of pure musicians, gifted with knowledge and curiosity to give and take simultaneously (…) Their music is friendly, intimate and playful." (Metrópoli, El Mundo). 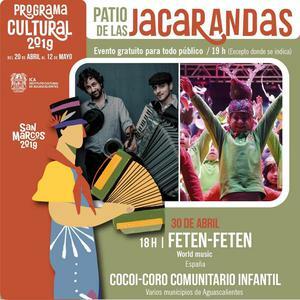 After studying accordion and flute, he started working combining tours with groups like “Celtas Cortos” with his own musical projects, music re- cordings, and projects in collaboration with musi- cians of different styles: Maria Salgado, Javier Paxariño, Manuel Luna Trio or Rao. In 2005 he joined “The Musgaña,” a musical project that gave him a different view of traditional music and allowed him to share and show Castilian tradi- tional music in countries like the United States, Canada, France, Algeria, Russia or Morocco.